To create a script runner reaction, you simply need the script you wish to run, and the Permutive segment you wish to target it to set up. Target this reaction to: The segment you want to see this reaction. Triggers (On Entry / On Exit / Every Time): When you want the script to run. On entry to a segment, when a user exits a segment, or every time they visit a page while in that segment. 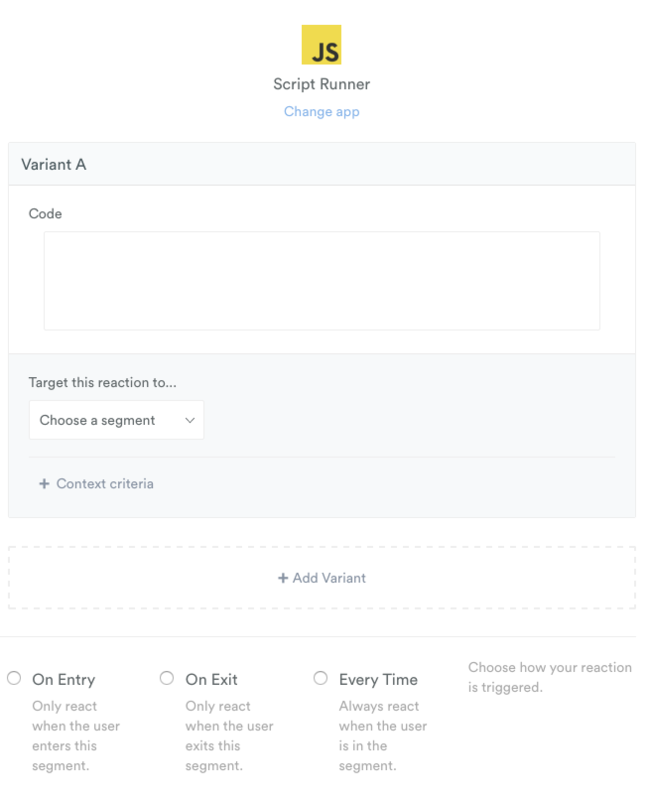 When using the Script Runner, you can track impressions and conversions for the reaction. You can track impressions and conversions using 'impression()' and 'conversion()' in your script. If you want to test a script on different audiences, or different script content you can set up multiple variants. These variants will be tracked in Permutive. You can set up a variant by clicking '+ Add Variant' and repeating the steps above. Variants are tracked in the A/B testing, and the dashboard will display conversion rates for each variant. Above is an example of an overlay A/B/C test, with results. Writing the JS usually requires a developer, so it's best to get in touch with us first to guide you through the process.